Poem number 20 from the Hyakunin by Prince Motoyoshi (元良親王: 890-943), the son of the Emperor Yōzei and a man known for his amorous adventures, is a poem of yearning layered with the fear of disappointment. The mitate nature of the juxtaposition of the woman with the poem is unclear to us. In the Bay of Naniwa. On the surface, the poem simply says that the poet will dare to meet his lover, even at the risk of his life. But there are many double meanings. Mi wo tsukushite means 'though my body be destroyed,' but miotsukushi refers to the stakes used as gauges of the height of the tides in Naniwa (Ōsaka) Bay. Perhaps the poet is hinting that if he does not meet his lover, his body will be found by the tide gauges. Suzuki notes that the poet can be saying he 'will stake his life' on the outcome, a pun that is also effective in English. Another thought is that he means his tears are flowing so freely they will have to be measured with a tide gauge. Dickins suggests that Naniwa naru (at Naniwa) is cognate with nan ja zo i (how will it end?). Brower and Miner see a double meaning in na ni wa naru (my name grows common). Murasaki Shikibu... may have had this poem in mind a century later when writing her Genji monogatari." There is a curious difference between this print in the Lyon Collection and in all of those shown in the links above. Those show a longer, more complex signature: 國貞改二代豊国画 (Kunisada aratame nidai Toyokuni ga). There is also another interesting print of a warrior by Kuniyoshi that uses/displays this same poem at the top. In this case it gives a different layer of interpretation to this poetic masterpiece. (See: The Hundred Poets Compared... by Herwig and Mostow, #20, pp. 75-76) We have added a link above to a copy of this print from the collection of the Museum of Fine Arts in Boston. 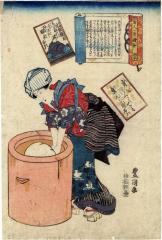 In an English translation of the description of this print from the museum in Vienna it says: "Her under-kimono is adorned with "Three Friends of Winter," bamboo, pine and plum blossoms, her apron shows a star pattern and mandarin ducks in the water."